Special Olympics Manitoba Parkland Region is grateful to receive the proceeds from Club Sapp VLT Gaming Centre’s 1st Annual Charity Golf Tournament on Sunday, August 9, 2015 at the Swan River Golf Course. 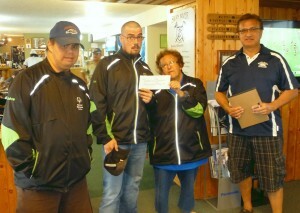 Pictured Above: Club Sapp General Manager, Larry Lavallee (right) presented the $1,570 donation to local Special Olympic Parkland athletes; Andy Brass, Ricky Zimmer and Lorna Chartrand. Special Olympics Parkland Region would like to thank Larry and Club Sapp, the local businesses, local golfers and everyone who supported the Charity Golf Tournament to help make such a generous donation. The funds will be used to help offset transportation costs to interprovincial competitions in the upcoming 2015-2016 season.